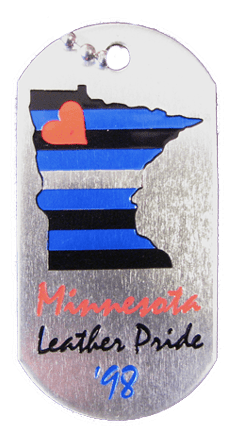 The Minnesota Leather Pride commemorative and collectible dog tag has been produced and sold by the Minnesota Leather Pride organization for over twenty years. 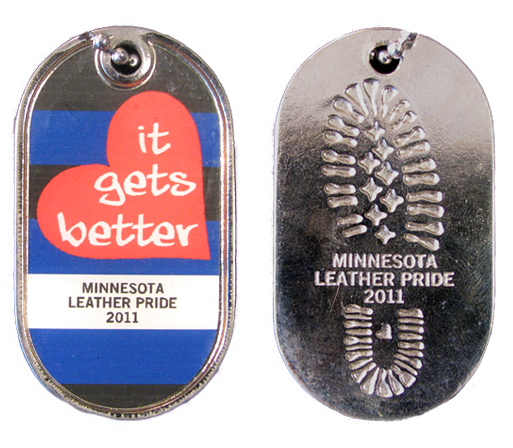 All except the first few dog tags reflected the theme of the year’s Minnesota Leather Pride celebration. 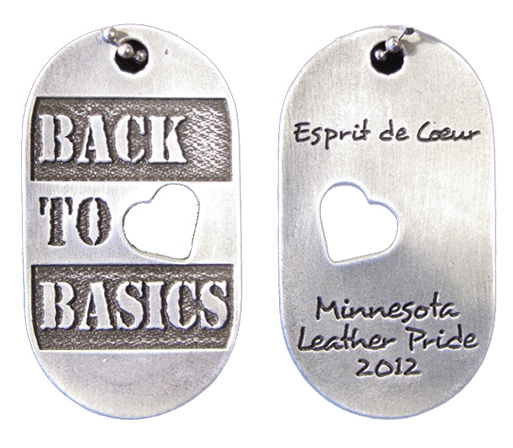 The concept of creating commemorative and collectible dog tags did not originate with Minnesota Leather Pride. 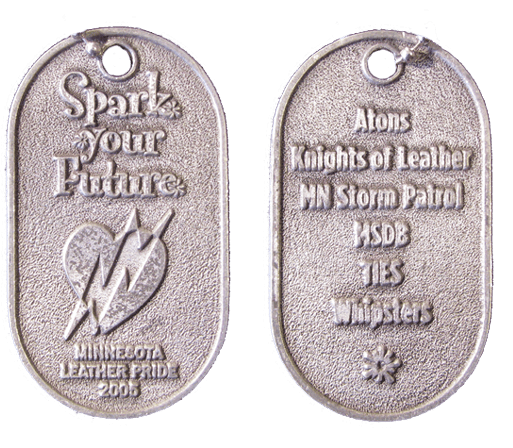 In the early 1990s, the Atons of Minneapolis produced several collectible dog tags that were given out at their annual Eros (spring) and Halloween (fall) parties. 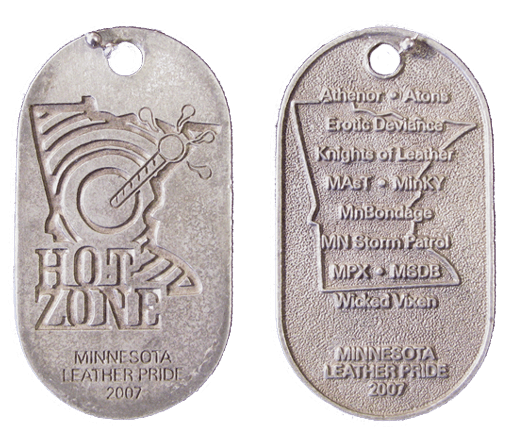 The first Minnesota Leather Pride dog tags (from 1994 to 1997) followed the basic format of the dog tags created by the Atons. 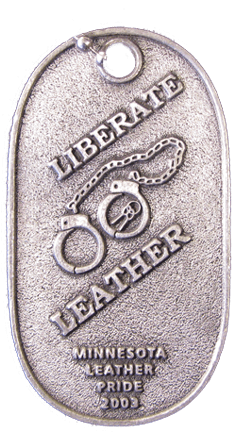 The dog tags were stamped out of a sheet of aluminum, and the design on the front of the dog tag was black and slightly recessed below the face of the tag. 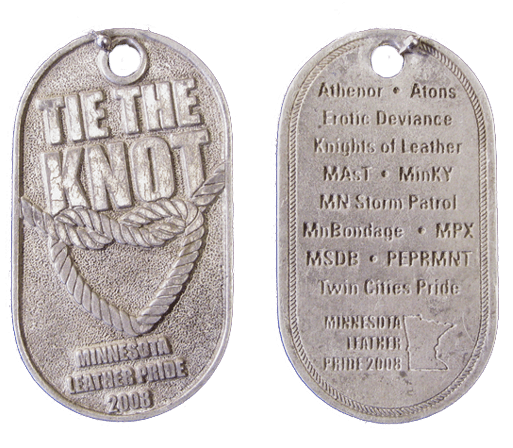 The dog tags were handed out at the annual Minnesota Leather Pride celebration, which at the time was a Sunday-afternoon gathering after the Twin Cities GLBT pride parade. 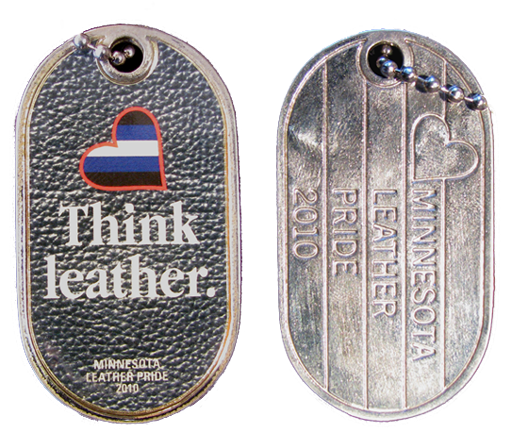 Starting in 1998, the Minnesota Leather Pride dog tags started evolving in design and sophistication. 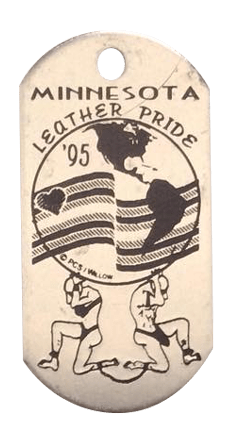 For 1998 and 1999, red and blue colors were added to the black to enable a color representation of the leather pride flag. The dog tag returned to black-only for 2000. 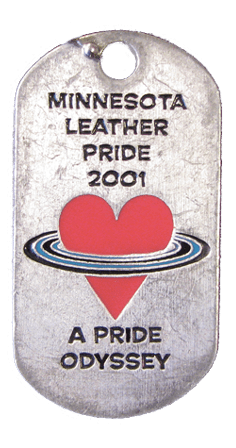 In 1995 and 2000, Minnesota Leather Pride actually produced and distributed a set of two dog tags. 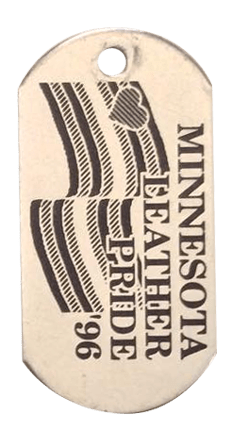 The bonus 1995 dog tag was in memory of Timothy John Newman (1965-1994), and the bonus 2000 dog tag was decorated with the logos of The Minneapolis Eagle and The Tank (which was The Saloon’s leatherspace at the time). 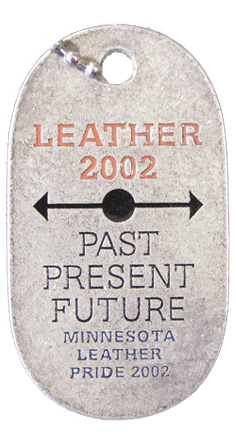 Starting in 2001, the Minnesota Leather Pride dog tag changed from stamped aluminum to a more substantial-feeling cast pewter. 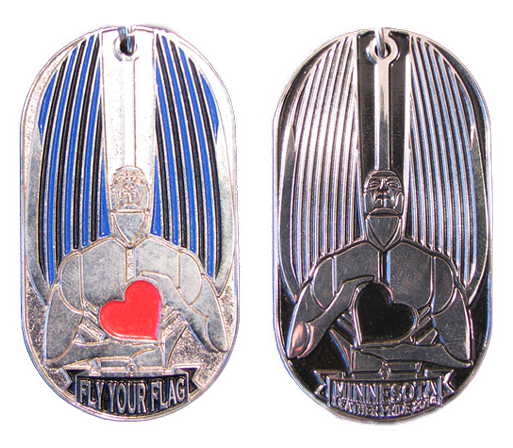 The thicker dog tag allowed a more deeply engraved design, which in 2001 and 2002 was color-filled with black, red and blue. 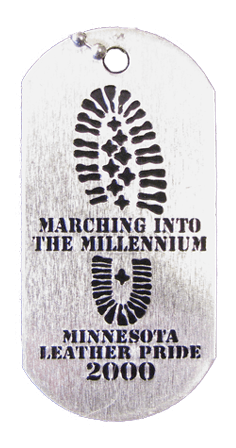 Dog tags for 2003 through 2008 were cast pewter with no color fill but with a more three-dimensional design. 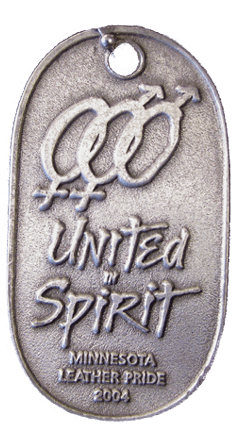 The dog tag for 2005 was the first with a design on both sides of the tag, and every year’s dog tag since then has been double-sided. The dog tags for 2009, 2010 and 2011 represented another evolutionary step. The tags still were made of cast metal, but instead of grey pewter the tag’s back and sides were a smooth and shiny chrome-type finish. The front of the tags sported eye-catching full-color printed designs sealed under a clear epoxy covering. 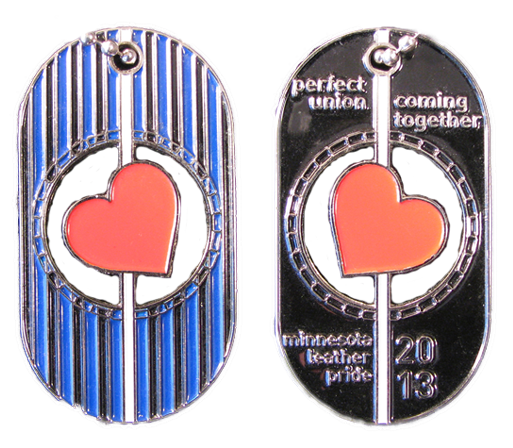 The 2012 dog tag returned to cast pewter but added a new design element: a heart-shaped cutout. While the 2013 dog tag included a more complex cutout as part of its design, the 2013 dog tag was the first to combine bright silver metal with cloisonné (enamel) coloring. 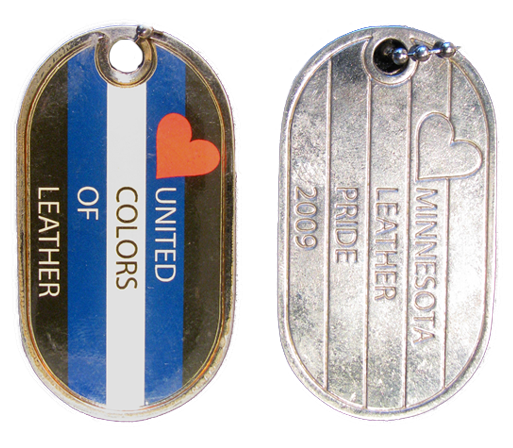 These two techniques, which also have been used for the 2014 and 2015 dog tags, have produced commemorative and collectible dog tags whose intricate designs and near-jewelry quality make a clear statement of leather pride. 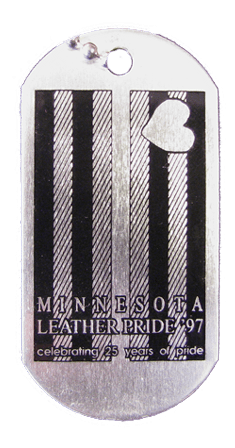 Silver tag with Minnesota Leather Pride ‘96 and a black and white waving leather pride flag. 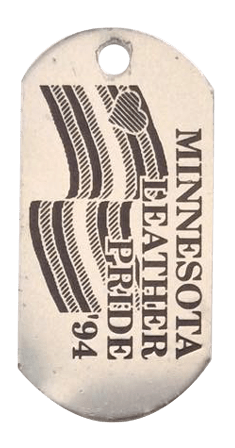 Silver tag with Minnesota Leather Pride ‘95, with a female and male, connected by leg shackles, holding up a globe with a black and white waving leather pride flag.